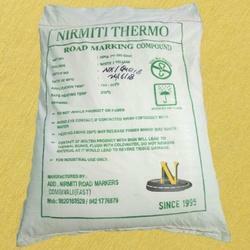 Our range of services include thermoplastic road marking compound. We are leading manufacturers, suppliers of Thermoplastic Road Marking Compound Grip-O-Mark is easy to melt and can be applied on asphalt/bituminous and concrete surface and have the advantages like Fast Drying, Reflective Property, Skid Resistant, Environmentally Friendly & Value for Money. Thermoplastic Road Marking Material with excellent whiteness. Intermix glass beads offer long lasting retro-reflectivity. Optimal balance between melt flow and flow resistance to achieve well-defined lines as per the desired width and thickness. Designed for tropical Indian conditions Excellent wear resistance and adhesion on asphalt roads Based on aliphatic chemistry; offers superior weathering resistance and color stability. Suitable for application to manual or screed/extrusion automatic machines.